Where do I use my Insync Bikes voucher code? At Insync, they believe that there are 3 components to creating the perfect ride, Design, Geometry and safety. Insync wants to ensure that their bikes are not only at the forefront of emerging styles and cycle technology they use extensive market research on buying habits and trend analysis to ensure they’re creating bikes designed with the owner in mind. Their bikes also focus on weight reduction, to make bikes that are easier to handle and better performing. Along with design, Geometry plays a huge part in the way your ride your bike to. Each and every bike found at Insync boasts better bike control and better riding efficiency and are designed to make everyday riding more fun. Bike safety is the most important and the core principle of the Insync Bike approach to design. As well as the standard safety features including bells and reflectors, Insync incorporates design details which consider the rider first. From tyre specifications to handlebar grips, Insync is constantly striving to incorporate safety considerations. With this, you can guarantee the highest quality alongside excellent value for money. Check out the superb selection of brands including Viking, Denovo, Riddick and Ryedale - individually tailored to suit different styles of riding and different audiences. Shopping with a Voucher Code from us here at NetVoucherCodes can make you a great saving at the checkout too. So whether you’re looking for 1 bike or wheels for the whole family, ensure you save money at the checkout with us. At Insync, they don’t just care about providing you with the best quality bike, but they also want you to be safe and equipped with the knowledge to utilize it properly. General maintenance and safety are always a priority when cycling. It’s imperative to run a few simple checks daily. Luckily, Insync has produced an essential How To guide featuring a video showing you exactly how to ensure your bike is as safe as possible. We here at NetVoucherCodes know how expensive it can be to kit your whole family out with quality bikes! However, we want you and your family to be able to do what you love without having to worry about forking a fortune. It’s for this reason we feature a wide array of money-saving Voucher Code right here on our Insync Deals Page making the latest technology in cycling more accessible for you and your whole group. Denovo is the Insync Bikes very own range designed just for children. Built especially for younger cyclists who love action, adventure and exploration, these bikes were designed to perform just like their grown-up counterparts! Featuring fun and unique designs for both boys and girls, find quality bikes you can rely on for children aged from 3 up to 11 years old. There is a world of adventure waiting to be discovered and that starts with a Denovo bike! Featuring convenient and easily adjustable seats and handlebars, this collection is perfect for yearning cyclist and can cost less when bought online with a Discount Code. Shop the range today and equip your kids out with the best bikes in the business boasting high quality, performance and safety at affordable and realistic price points. The Riddick collection of bikes is committed to action, adventure, fun and friendship and aim to be the first choice action and adventure bike brand for mainstream, male cyclists alike! Whats sets Riddick’s Men’s Mountain Bikes apart from the rest is their attention to detail and confident, inspiring performance. Designed by experts in the business, you can rest assured that with a Riddick Mountain Bike you’ve got your hands on the best of the best. Both cycling enthusiast and casual riders can enjoy the Mountain Bike collection by Riddick and enjoy the simply stunning and capable range designed by prod and packaged for everybody to enjoy. If you are wanting to return an item, you will need to return the product within 14 days of receipt and ensure the products have not been opened. To get the order back to Insync safely, you will need to log into your account and contact the customer service team. 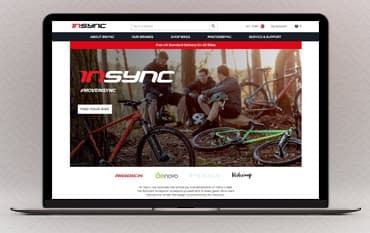 Whether you’re a keen cyclist, you’re taking up a new hobby or riding for fun with friends or family, Insync creates bikes for every rider, for every lifestyle. At Insync, they believe that riding a bike is more than just a sport or for fun, but it's a shared togetherness that brings joy, freedom and independence. Through cycling, there is a world of experiences to be discovered, so be sure to do it with Insync, Featuring a wide array of brands including their very own technically advanced and innovative designed bikes, there is something for the whole family to enjoy. Shop with an Insync Bikes Discount Code too for added savings when you buy online.